Additionally you can award achievements by entering special activity codes. You can set a unique code per achievement. This could be useful if you want to award achievements for visiting special “real life” events. A Quest is a more complex task that a user needs to complete. WPAchievements allows you to set an unlimited number of tasks per quest. 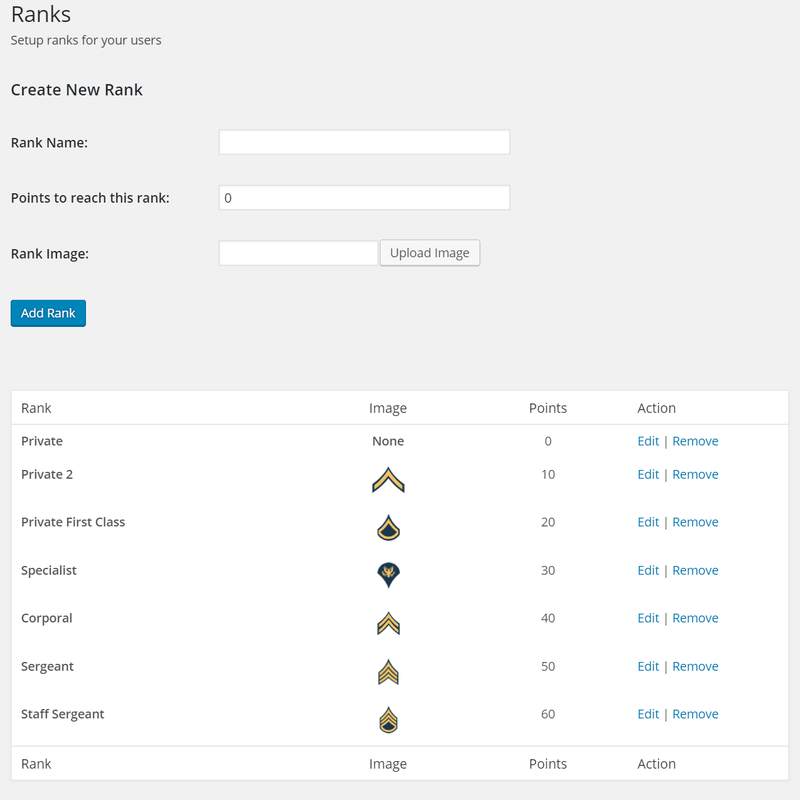 You can create unlimited ranks for your users to help promote user activity! 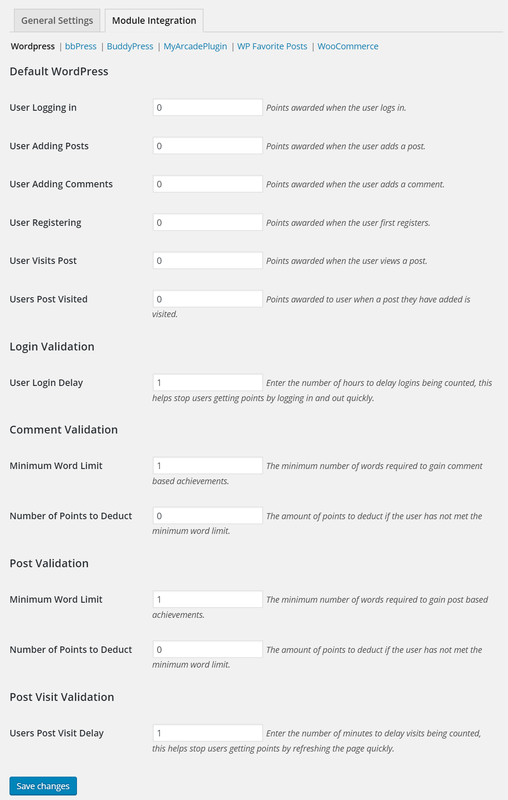 WPAchievements keeps track of your user’s points and allocate them to the ranks that you create. All your Achievements & Quests are displayed on a custom created page so your users can compare what they have unlocked and discover what is left to gain. The new Shortcode Editor allows you to add and mange WPAchievements shortcodes with ease. You don’t need to read the documentation in order to use the shortcodes anymore. Just configure the desired chortcode and click on “Insert Shortcode”. Whenever a user gains a new achievement they have the ability to share that achievement via Facebook and/or Twitter! This is optional and can be deactivated. A very nice pop up notification will inform a user when he unlocks an achievement or solve a quest. WPAchievements will nicely integrate with BuddyPress and Youzer. 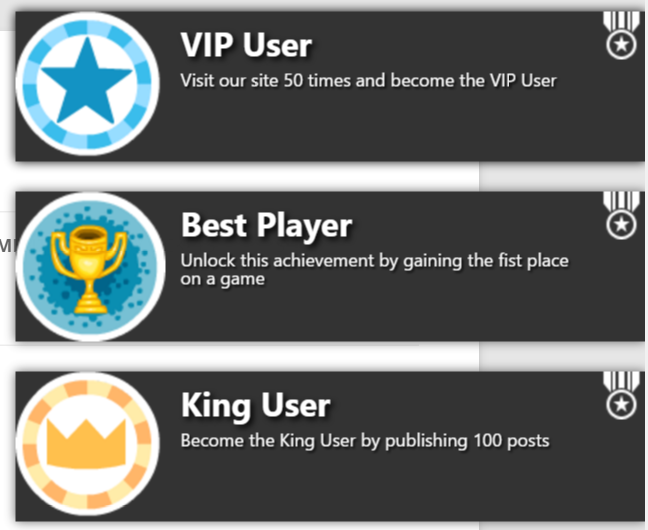 It will extend the user profile page and show users Achievement, Quests and Rank. Additionally you can use WPAchievements Shortcodes on Youzer custom widgets to display user achievemnets, quests and rank. 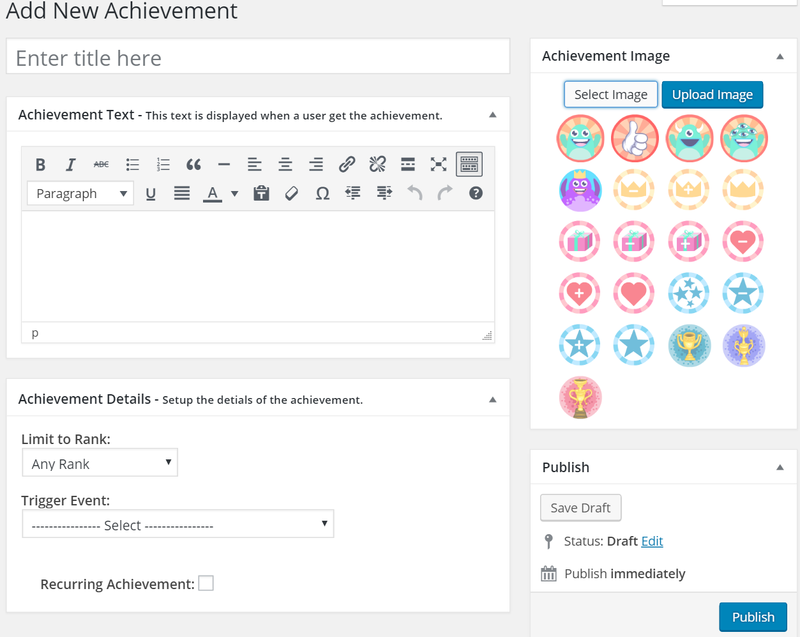 WPAchievements is able to publish accomplished Achievements & Quests to users activity stream automatically! At the reports dashboard you will get an detailed information about your site activity. Track user actions and progress to be able to optimize your site. Restrict Content – Lock away premium content! WPAchievements gives you the ability to lock entire content or parts of posts and pages so that only users that have gain a special achievement, solved a defined quest or reached the needed rank will be able to see them. Here is an example of restricted part of a premium content by required achievement. You can do the same for quests and ranks, too! Here is an example of restricted page. Only user with required rank will be able to see the full content. The site administrator is able to manage the user points and achievement easily by using the WordPress user backend function. 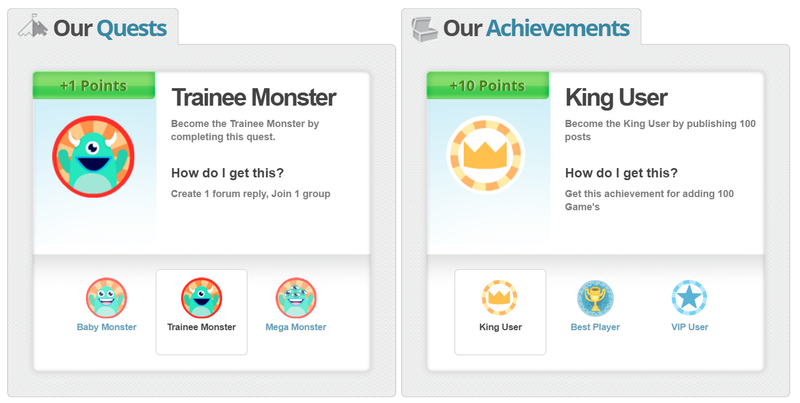 You are able to check and adjust the user points, achievements and quests. Please check the Plugin’s FAQ page for full documentation for available shortcodes. 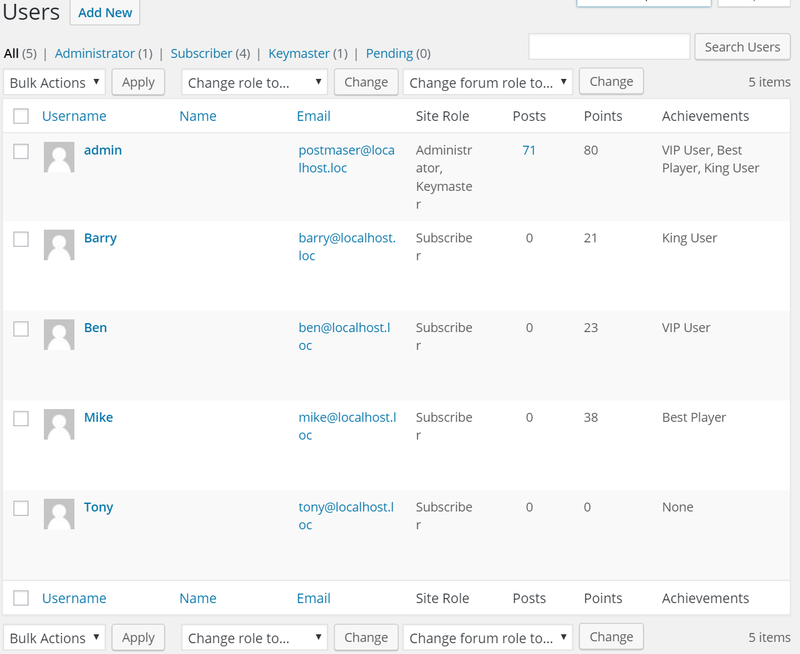 The new structure of the settings backend allows you a clear and well organized options area. Nowadays it is very important to keep your WordPress site and plugins updated. Every day new security fixes are released and it takes a lot of work to keep all plugins up to date manually. This will allow you to update the plugin comfortable from the WordPress backend. 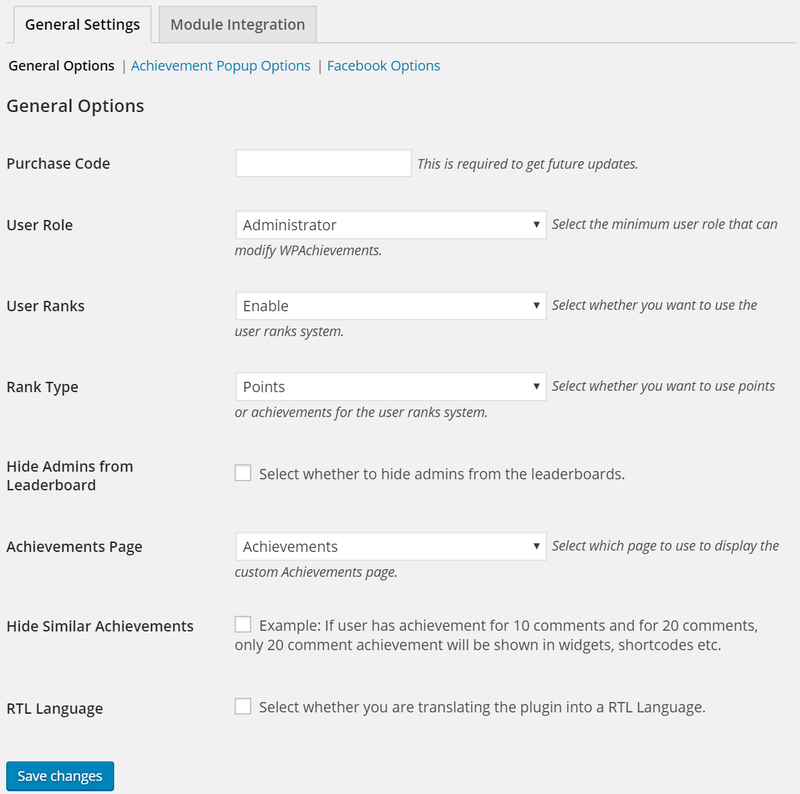 Just enter your CodeCanyon purchase code in the plugin options and enable the power of the new update function. If you didn’t find a plugin in the long list of supported plugins please feel free to contact us. We will be happy and willing to add support for the requested plugin. Use the chance to keep your site interesting for your users. - Tweak: A lot of code quality and security improvements. We achieved grad A certificate by Codacy! 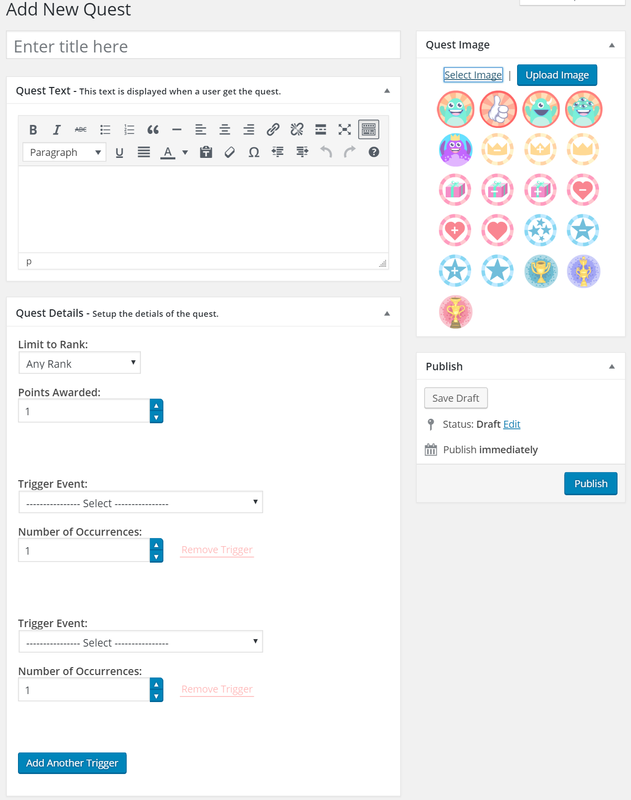 - New: Select Quest easily using a Drop Down List in the "Widget - Quest progress"
- New: Award achievements by entering a special "activity code"